At Bryngarw, we believe that exploring the great outdoors and learning about the local natural environment is a fundamental part of a child’s education. The Rangers offer a variety of exciting hands-on environmental education activities which are designed to allow children to explore and discover the natural world around them! Discover how a tiny seed turns into a towering tree and where animals love to live… Whether it’s wandering through the deep dark woodland, flower-filled meadows or down the winding muddy paths along the river, take a walk on the wild side with a Ranger and learn some amazing things! Prepare to get your hands dirty as you explore the dark muddy world that minibeasts love to call their home! 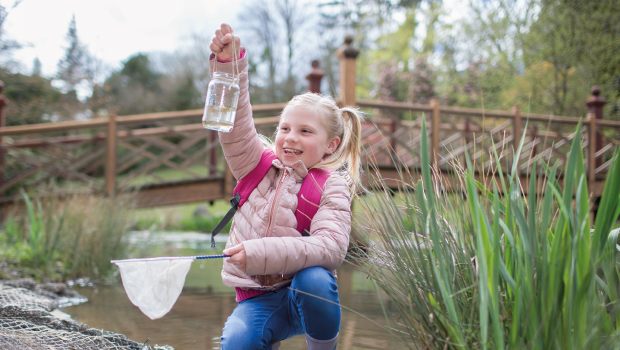 Based in our enchanting nature garden, join the Ranger on a hunt for the park’s creepy crawlies – from worms and slugs to millipedes and beetles – what minibeast will be your favourite? The ponds at Bryngarw are teeming with life. Armed with nets and trays, join the Ranger to discover the weird and wonderful creatures that lurk beneath the surface! Could you make a sturdy den using only branches and leaves? Join the Rangers to discover what makes a good survival shelter and get to work building your own cosy creation! This activity is great for team-building, co-operation…and imagination! It is a two hour stand-alone session which includes a bushcraft-themed nature walk as well as the shelter building activity. Choose TWO of these activities in any combination! From £3 per child*. From £4 per child*. Due to the nature of this activity, there is a limited capacity per session. *Prices vary depending on group size and number of sessions required. Please contact the Rangers to discuss this.